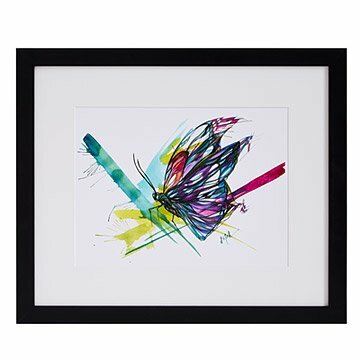 This beautiful butterfly print was inspired by a Native American tale of wish fulfillment. Layering expressive strokes of vivid watercolors, self-taught artist Sarah Janece Garcia turns a butterfly study into a celebration of delicacy and beauty. "Whispered Wishes" was inspired by a Native American nature allegory: for a wish to come true, you must first catch a butterfly and whisper your desire to the captive insect. Once released, to show gratitude for its freedom, the butterfly carries that wish to help ensure that it's granted. Through vibrant greens, blues, and magenta, Sarah captures the fleeting beauty of this tale and the beautiful creature at its heart. Image made in San Antonio, Texas; printed and framed in Portland, Oregon. Although I had to return this product once for creases in the back as well as through the print, I still gave it five stars. 5 stars because a new print was replaced quickly and without difficulty and, of course, 5 stars for the beauty of this print. This artist's work is noticed by everyone who sees it. Her watercolors "pop" and complete any room where they are placed. Sarah continues to deliver beautiful art! This is the third piece of Sarah's art that I have purchased. It is stunning! I can't wait to see what she brings out next!